Important clarification/disclaimer: I received this product for free as a review item. Note: If you’re just here for the giveaway, scroll all the way down, but I encourage you to read the review, too. 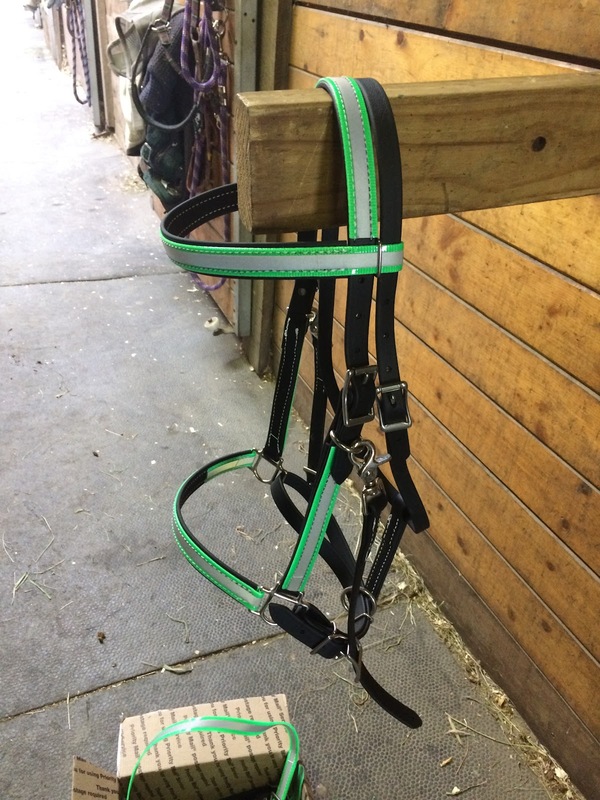 Two Horse Tack is a US-based maker of custom biothane strap goods – bridles, halters, harnesses, breastplates, etc. They have a genuinely dizzying array of different styles, colors, sizes, and options. 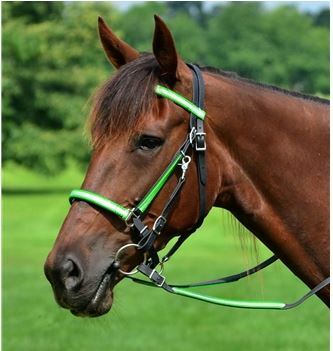 I’ve thought seriously about a biothane halter-bridle combination for years. It always seemed just outside of sensible when I had so many other things (like vet bills) on my plate. So I was stupid excited to get an email from Two Horse Tack offering me my pick of anything on their website in return for a review & a giveaway promotion. No arm twisting required! The retail price for this combination was $112.50, which is actually really good for a new bridle with reins! Because every piece is custom-made, it didn’t ship immediately, but it also did not take too long at all; my records show that it shipped within 2-3 days, and took another 2-3 days to get to me. I was really pleasantly surprised. Since its arrival, we’ve been sort of up and down, but I’ve ridden in it about a dozen times, both in a trail riding and a schooling context. Overall impression: I’m really, really pleased. I think it looks sharp. The hardware is all nice stuff, and the biothane itself is way nicer than I would have guessed, not having much exposure to it previously. It was stiff to start off with but is loosening up nicely. The dayglo overlay absolutely stands out, and the reflective strip is VERY reflective. Fit: Horse size was definitely the right way to go. Tristan’s head is a comfortable fit; when you actually read their sizing guidelines, their horse size seems to be on the small side. 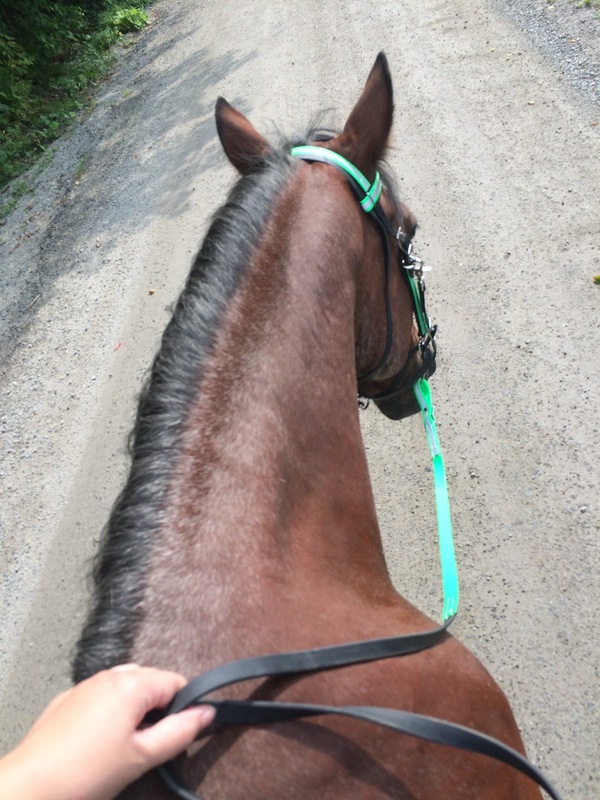 The reins are definitely on the long side, which is actually totally fine for trail riding. It might get a little irritating for schooling. The good news is that the biothane is probably really easy to just snip and re-punch if you wanted to shorten them. Quality: Like I said, pretty darn impressed. The hardware is solid, and the biothane is really quite nice. It feels more rubbery than plasticky, soft and light. There are a small number of spots where the stitching is not perfectly in line, but it’s only noticeable on very close inspection. I’ve gotten several admiring compliments on it, and it is my go-to for any kind of field or road hack, especially now that we’re entering hunting season. I love, love, love the halter bridle aspect of it, for a lot of reasons. 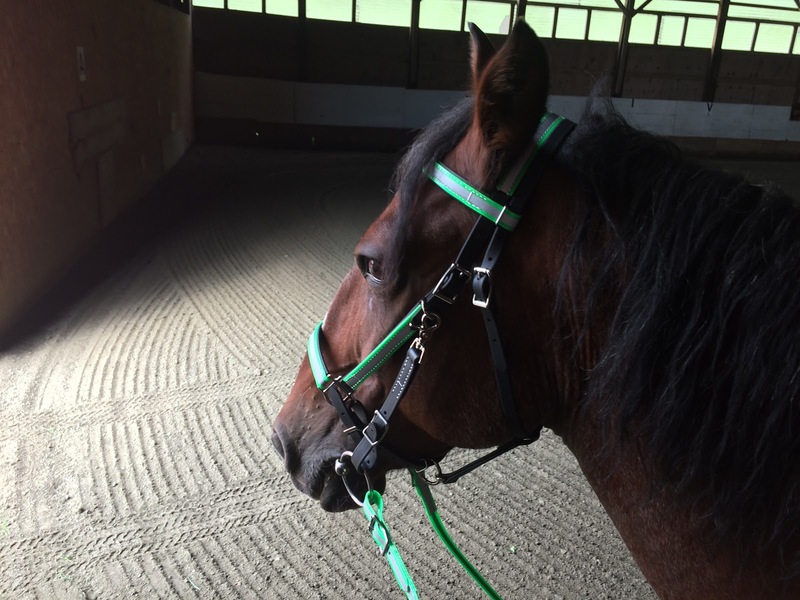 My current favorite is that if I forget something at my stall or in the tack room – a not infrequent occurrence – I can just toss him on the crossties and hustle back to grab it, rather than take off his bridle or ask someone to hold him or any number of inconvenient options. However, the first time I put it on resulted in a rather derpy moment. Tristan would like you to know that his mom is an IDIOT. It was like my brain got mixed up between halter and bridle and I honestly stared at the bit hanging below his jaw for a moment in deep confusion. Like…wait I did what I was supposed to – OH. The good news? I just unclipped the bit, slid it into his mouth, and then clipped it back on without undoing the whole bridle! In summary: I love this thing. I was excited to try it out, and it was precisely what I wanted. It’s not often you can say that about something! SO. Now for the most exciting part: the giveaway. Two Horse Tack is sponsoring a giveaway just for readers of this blog. They’re giving away a Western breastcollar. I know most of you ride English, but I just spent a long time studying the photographs of the breastcollar and…it’s basically the same thing, without the grab strap. 1) Go to Two Horse Tack’s giveaway page. At the bottom of the form, enter “Bel Joeor blog” when it asks how you heard about us. This is the really important step – that will make sure you’re part of the smaller pool of people who are eligible for just this giveaway. 2) Leave a comment here letting me know that you entered the giveaway. If you spent some time perusing the website, tell me what caught your eye – what would you want to buy for yourself? The giveaway will run through 10/31. Two Horse Tack will contact the winner directly but I’ll stay in touch as well and make sure everything goes smoothly. I've actually been looking for an affordable, durable western bridle for my mare to ride when we are out and about, not in the ring. I'd probably go for a red or purple one ear western bridle! I've never heard of these before! Looks like a nice step up from my Wintec bridle that I use for trail riding. 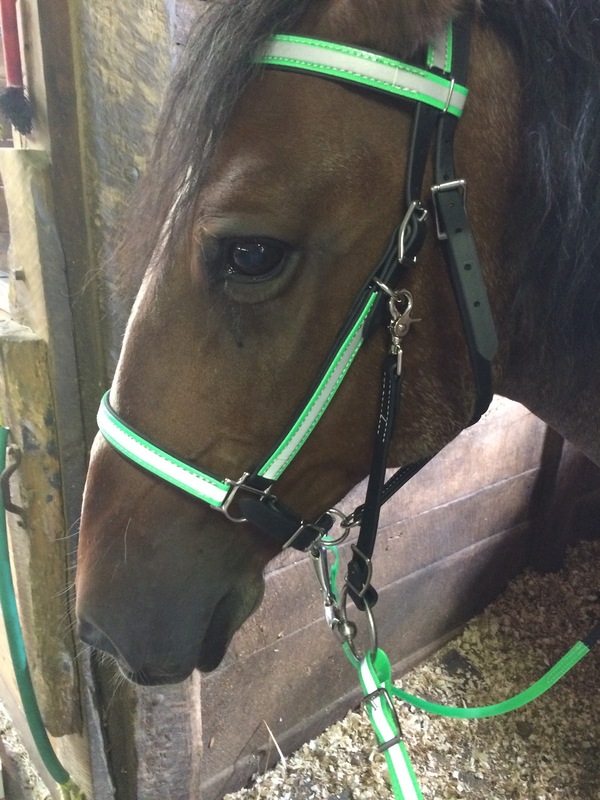 I love the halter bridles also and especially the day-glo for visibility too. I would probably get the exact same one as you! I like the harnesses too for if I ever get around to teaching Maggie to drive!